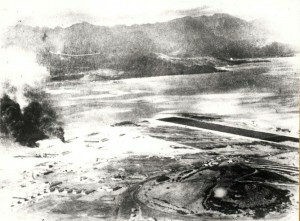 Japanese photograph of runway at Kaneohe Naval Air Station under attack on December 7, 1941. 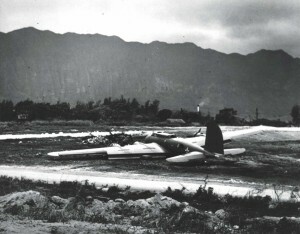 One of 12 B-1s from U.S. Mainland to Hawaii unable to land at Hickam Field due to Japanese attack, made a belly landing on the short fighter airstrip at Bellows Field, on December 7, 1941. 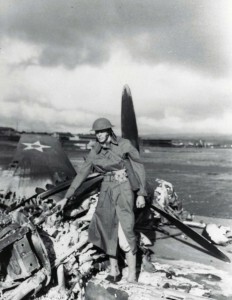 Three P-40s that attempted to take off from Bellows Field on December 7, 1941 were shot down immediately. Most of the 12 P-40s there, like this one, lined up in neat rows, were riddled by Japanese machine gun fire. 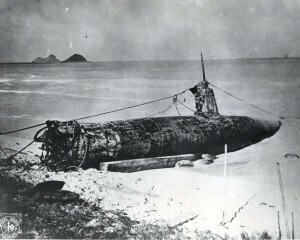 Japanese midget submarine went aground at Bellows Field on December 7, 1941. 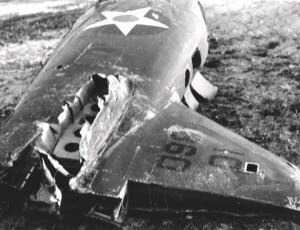 It was salvaged by a Navy crew. 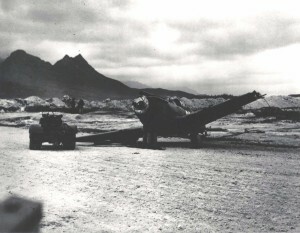 Fuselage of wrecked O-47B at Bellows Field following the December 7, 1941 attack. 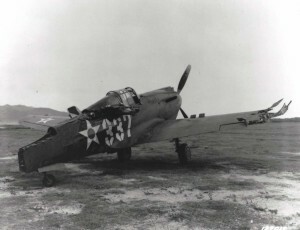 Damaged P-40 at Bellows Field, December 7, 1941. B-17 remains on Hickam Field Flight Line, December 7, 1941. 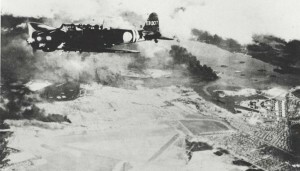 Two Japanese aircraft were photographed over Hickam Field by crew members of one of 12 B-17s that arrived from California in middle of attack. 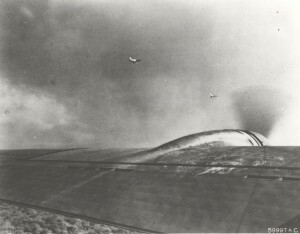 This is one of first photos of December 7, 1941 attack. 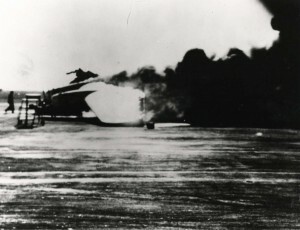 Smoke billows from burning B-17 on Hickam Field flight line, December 7, 1941. 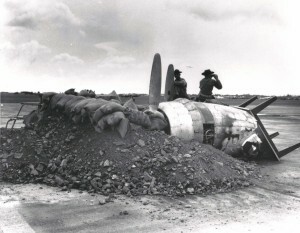 The first bombs to strike Hickam Field were dropped on parked planes and the hangar line, December 7, 1941. 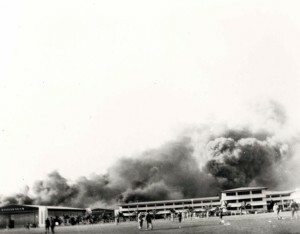 Personnel cross parade grounds in foreground to view damage. 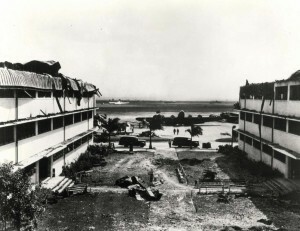 Looking out toward Hangar Avenue and the flight line from coutyard between heavily damaged Wing E and Wing D of the big barracks at Hickam Field, December 7, 1941. 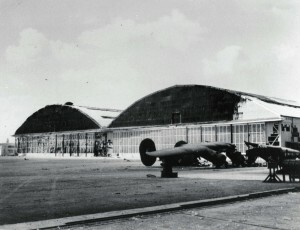 Hangar 35 Dock 1 at Hickam Field with an A-20A aircraft of the 5th Bomb Group on left and O-49 aircraft on right, December 7, 1941. 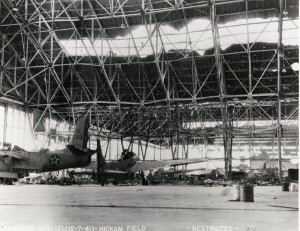 Inspecting Hickam Field Hangar 1 damage, December 7, 1941. 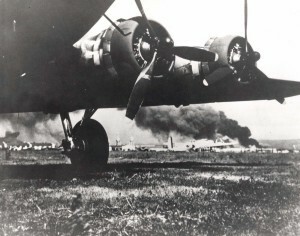 A 5th Bombardment Group B-18 aircraft can be seen in background at right. 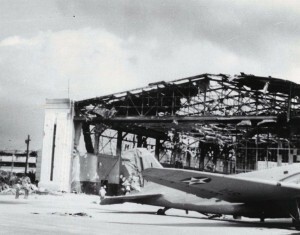 Destruction inside a hangar at Hickam Field shortly after initial raid, December 7, 1941. On left is B-18 assigned to 5th Bombardment Group. 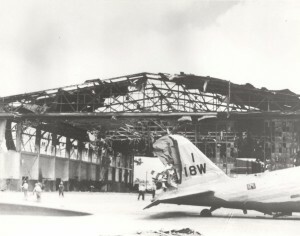 B-18 outside of Hangar 11 at Hickam Field after December 7, 1941 bombing. 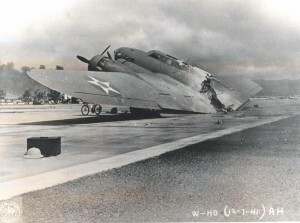 A B-18 belonging to 11th Bombardment Group outside of wrecked hangar at Hickam Field, December 7, 1941. Gun emplacement in front of Hangar 5 at Hickam Field, built with a burned out aircraft engine, table, sand bags and debris, December 7, 1941. 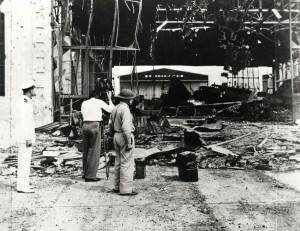 A hastily constructed gun emplacement in front of Hangar 5 was manned by PFC Raymond Perry and Cpl Howard Marquardt shortly after Japanese raid on Hickam Field, December 7, 1941. 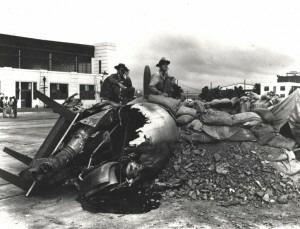 B-18 wreckage on Hickam Field flight line, December 7, 1941. Drawing of Hickam Field with Japanese planes flying over, December 7, 1941. 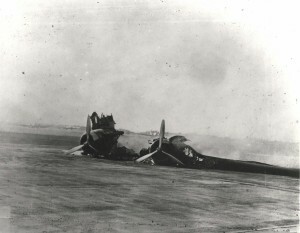 B-18 wreckage on flight line at Hickam Field, December 7, 1941. 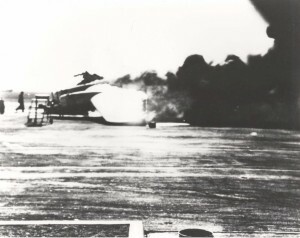 B-17 frames the devastating results from Japanese attack on Hickam Field, December 7, 1941. The smoke in the background is from USS Arizona which Japanese bombed. 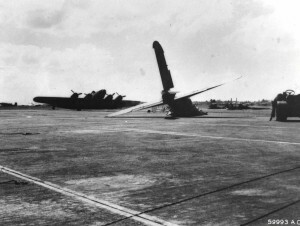 The B-17s arrived at Hickam the morning of the attack. 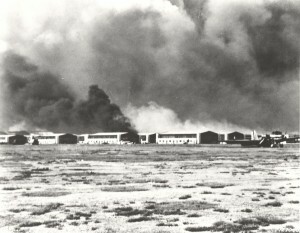 Hangar row after bombing of Hickam Field December 7, 1941 as viewed from the flight line. 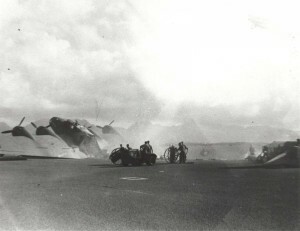 Flight line at Hickam Field, December 7, 1941 during bombing. 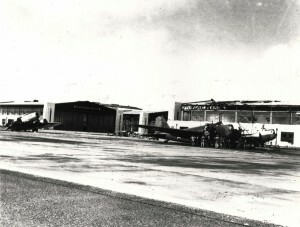 B-18 parked in front of Hangar 13 at Hickam Field with B-17 on the left near Hangar 17, December 17, 1941. 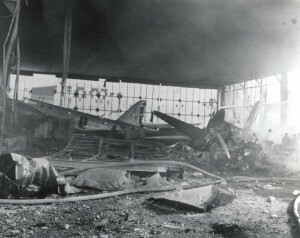 Wreckage of B-17C bomber beside Hangar 5 at Hickam Field after Japanese bombing on December 7, 1941. 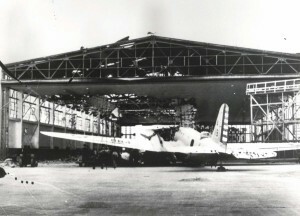 B-24A assigned to 1st Photo Group, 44th Bomb Group, arrived at Hickam Field on December 5, 1941 to have guns installed prior to continuing to the Philippines to fly reconaissance missions. It was strafed, burned and destroyed on December 7, 1941.